Here in the beautiful Rogue Valley, everyone wants clean rivers and streams. Our waterways provide habitat for fish and wildlife, recreation, and a source of drinking water. Unfortunately, recent pesticide monitoring efforts (by the Middle Rogue Pesticide Stewardship Partnership) have detected various pesticides in Rogue River tributaries and groundwater supplies. Glyphosate, the active ingredient in RoundUp, was detected in almost half the water samples collected. Pesticides are any substance that is used to combat insects or other organisms that are harmful to cultivated plants or to animals. On average, suburban lawns and gardens receive more pesticides than any other land use type, including agriculture! 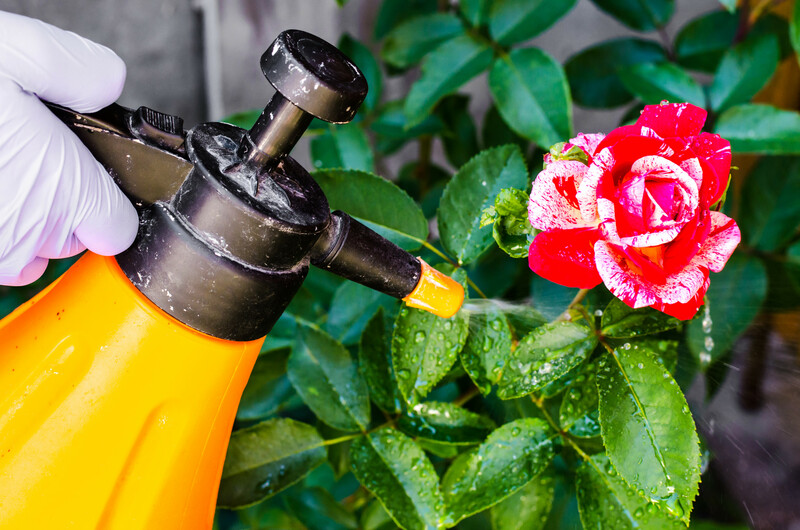 When used improperly, pesticides can harm humans and pets contaminate drinking water supplies, or negatively affect native plants and wildlife. Salmon are especially sensitive to pesticides. Keep reading to find out more information about how you can reduce your pesticide use. Help us keep pesticides out of our waterways. Take the Pledge to Reduce Chemicals In Our Streams! These people have also agreed to follow the recommendations of the Pesticide Pledge to reduce the amount of pesticides that enter our streams. We all need to work together to ensure the health of our watershed by reducing pesticide use. Rain and wind can spread pesticides, and other chemicals used on your lawns and gardens, into local streams, even if you do not live next to a waterbody. You can help prevent pesticides from reaching our waterways by pledging to reduce the use of pesticides on your yard and property! As a resident in the Rogue River watershed that cares about protecting water quality for people, fish, wildlife, drinking water and pets - here is your chance to take the Pesticides Pledge! There are many surprisingly easy ways (to part with or use pesticides) that still allow you to have a great looking lawn and garden. Here are a few practices that we recommend. Place the right plants in the right place. Site characteristics such as light, water, and soil requirements may reduce the need for pesticides and watering, as well as lessen the chance of plant mortality. Think before you buy. Always identify the source of our problem, then decide what you want to do about it after considering the risks and benefits of the options available. Choose the safest and most appropriate product for your pest problem. Hand treatments or Integrated Pest Management (IPM) may be the safer and more economical choice. Follow the label and use only what you need. The pesticide label is your guide to using pesticides safely and effectively. The directions on the label are there primarily to help you achieve "maximum" benefits - the pest control that you desire - with "minimum" risk. Read the label before you buy the pesticide and every time you use the pesticide. Spray in safe conditions. Air currents and rain storms can carry pesticides off your property onto your neighbor's land, into groundwater acquifers, and local water ways. Keep pesticides where they belong by not spraying in windy conditions and before storms. Store and dispose of pesticides and empty containers properly. Follow storage and disposal instructions on the label. Keep pesticides in the original containers and away from areas prone to flooding. Never empty leftover pesticides into the sink, toilet, or street drain. Municipal systems may not be equipped to remove all pesticide residues. Extra pesticides and empty containers can be recycled at community household hazardous waste collection events. Visit Rogue Disposal's website for more details.